I’ve seen the advice given to new game masters (or game masters who have lots of trouble) when problems arise, that they should just improvise. I’ll admit that I’m taking this totally out of context it, and doesn’t reference any one piece of advice from a column or blog I’ve read. This is mostly a rant. Mostly. I’m an actor, and I have performed improvised comedy before a live audience on numerous occasions. One of the things I have to say is that not everyone has a knack for it, and contrary though it may sound, improvisation requires practice. It’s a skill for filling in the blanks provided by the framework of a scene. Like Mad Libs. How long was your first game of Arkham Horror? Be honest. Actually, how long is every game of Arkham Horror? How long does it take you to learn a new game? How long did it take you to learn Checkers, Chess, or Poker, or any number of Poker variants? 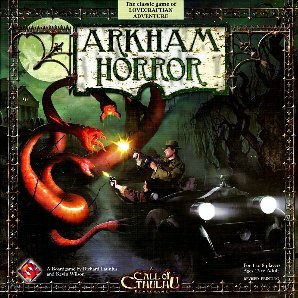 How about Arkham Horror or Risk? Now, how long did it take you to become very good at the game? Did you do really well the first time you played? How deep was your strategy when you first played? Have you seen how well the good players perform? It’s a safe bet actors have played the games before, and even then there are only so many games each actor can learn or play well. Each game provides a framework which they fill in with actions and dialogue. Improvisation in a game master role is much the same. You are at once the host and a player in each scene, describing the situation and then inserting yourself as a participant, directing the scene toward a conclusion, and then ending the scene as you deem appropriate and moving on to the next scene. And so on, and so forth. Good game masters will draw on various aspects of their own life experience to describe situations the players can relate to – and every game session is unique in this way, since everyone’s experiences are quite different. It isn’t just about imagination, but about a practical application of imagination. One area where I improvise a lot is in combat. Being a tactician isn’t necessary to improvise a good combat encounter in D&D, and I know because I’m not a tactician. However, knowing how creatures and characters might act within the context of battle can go a long way toward making a good scene, and I can do this intuitively. Once I realized how little the vast majority of Fourth Edition stat blocks really mattered in the context of the game, I ditched the monster books in favor of a single stat block per level. When I run encounters, I use the same defenses, the same hit points, and the same attack values for almost every monster, and improvise the descriptions. This is not a method I would recommend to most game masters. Lots of players and game masters alike require flavor like power names and special effects to describe how their creatures and characters interact with the battlefield. I tend to fluff most of that up on the fly because I have years of experience working with players and monsters, and now that kind of material just gets in my way. Practice placing obstacles in your players’ way and helping them to overcome them in a consistent manner. Respond to player inquiries and reward them for curiosity and ingenuity. Learn to recognize when you have created expectations in your players, and find unique ways to fulfill those expectations. Play the games you’re good at.